Home Accessories A Guide To Pick Latest Gold Jewellery Designs For Weddings! Let’s consider this, you are about to head for a wedding. You have spent a fortune to get an impeccable dress, your makeup is on-point, you even have a good hair day, now what? In spite of perfecting every section in styling, you can’t hit a nail with your outfit, if you don’t choose complimenting jewelleries. 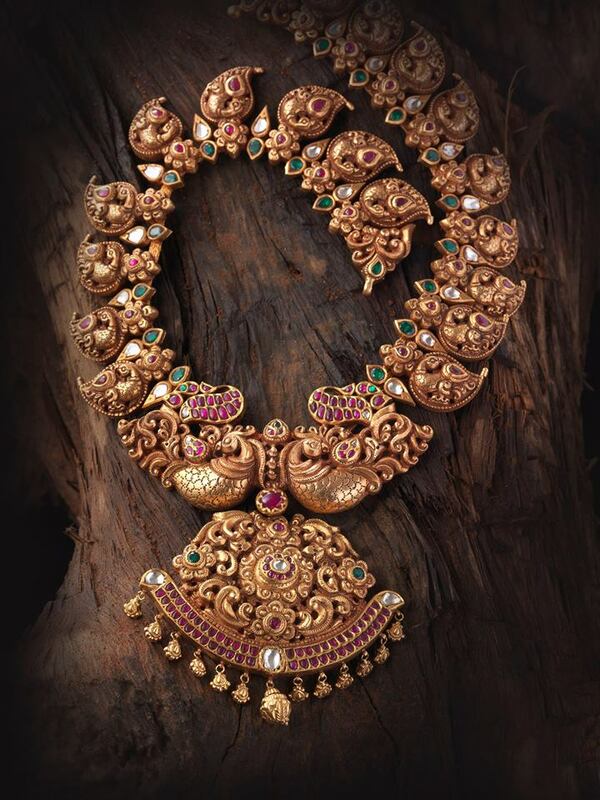 Especially, the colorful events like wedding demands bold gold jewellery to stand out from the crowd. Let’s see where the jewellery trend is heading. If you know what the hot picks of this season are, you can plan your jewelleries based on that and can look dashing on the event. One hitch though, gold jewelleries are not pocket friendly isn’t? Hence it is all the more essential that you have good knowledge on what are the latest designs that are worth investing, and whether it would flare well on you. Any mishap in the selection only results in busting the money on wrong choices and later regretting for it. Ok..Enough of the rant! Let’s get to the matter. 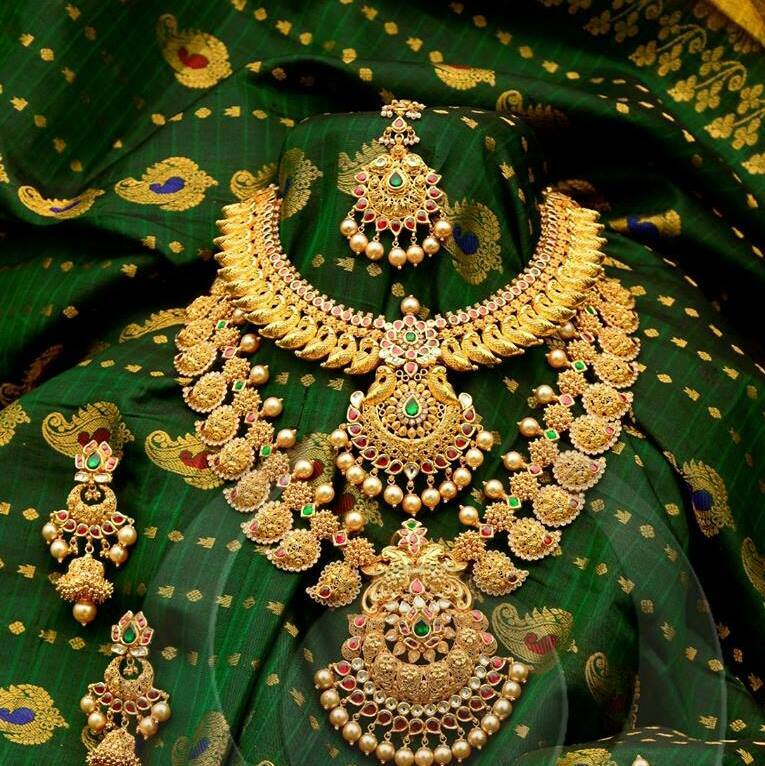 Below we have compiled all the nice looking latest gold jewellery designs of this year. Scroll down and take a good look. What do you think about the deep red ruby stones that electrify your look and make for a stunning appeal? 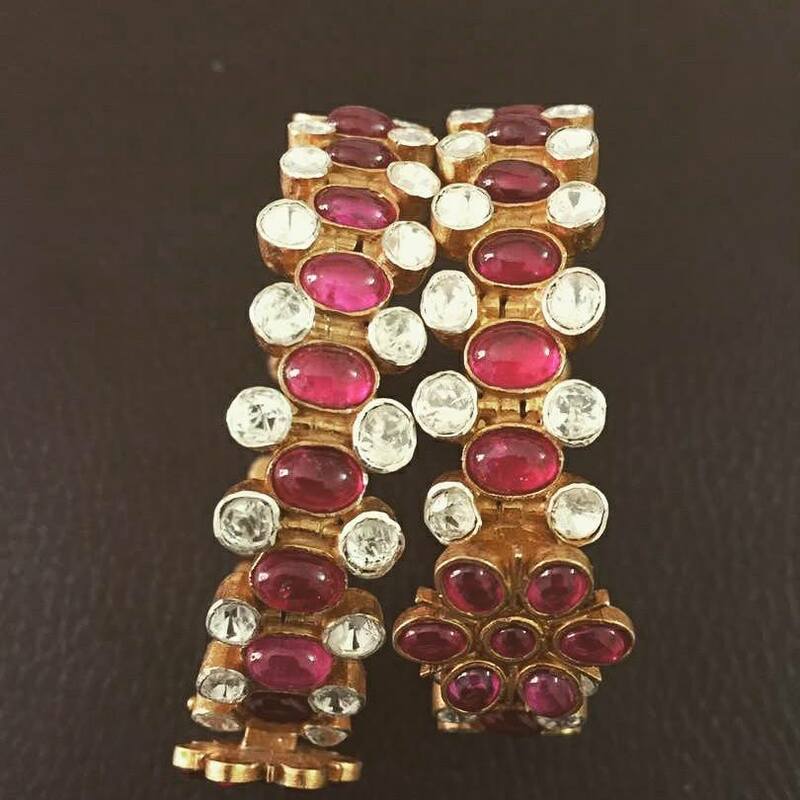 More than any decade, past few years has been in complete grip of statement ruby jewellery. 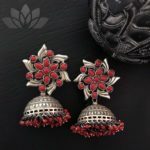 Bold antique long harams, short chokers, big jhumkas and bright kadas, studded with rubies are crowding the jewellery store. Yes, it has becomes bride’s favorite section which will be evident if you just take a peep into any wedding hall. 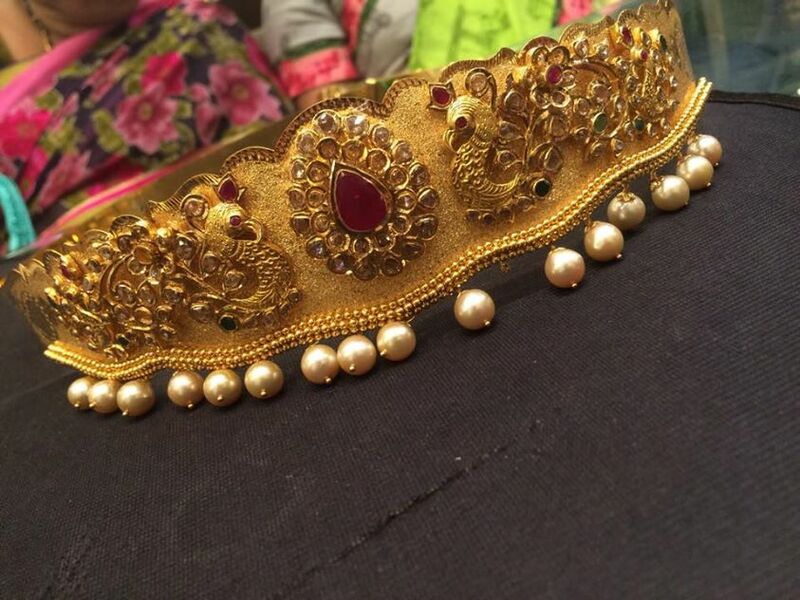 So, do you have good red/maroon silk sarees on your closet, then this might be the jewellery you need to tend to. Ok. We agree fine long necklace is always a good thing to flaunt not just with your sarees, but even with salwars and festive kurthas too. However, this season is all about bold pieces. So if you have been planning to shop long harams, ditch the old models and go for layered designs. Especially the brides, who need to deck up jewelleris on the D-day, do hear our advice. 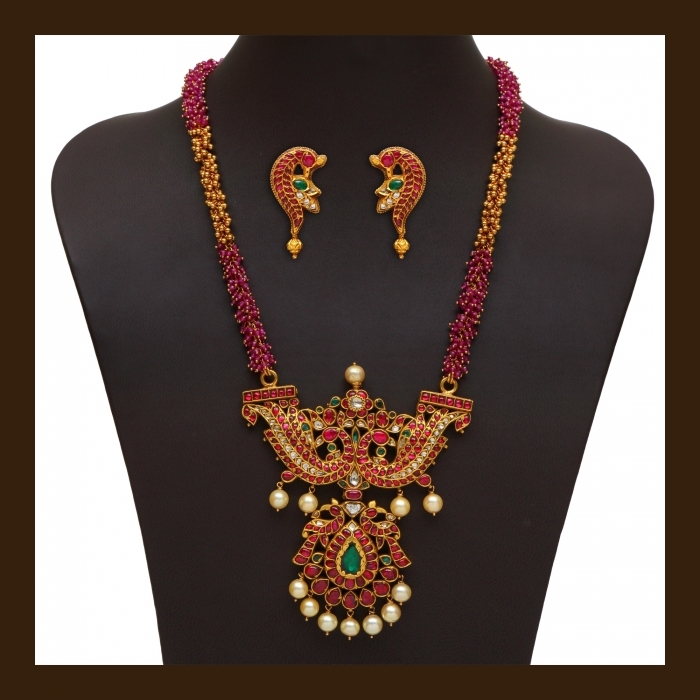 With multilayer necklace and harams, you are sure to look wonderful in the crowd. Big ball harams and step necklaces with side lockets are being fancied by everyone this season. Do you like to look traditional with fine jewellery at your arsenal? Then go blind and pick the ones that has goddess lakshmi image embossed on it. 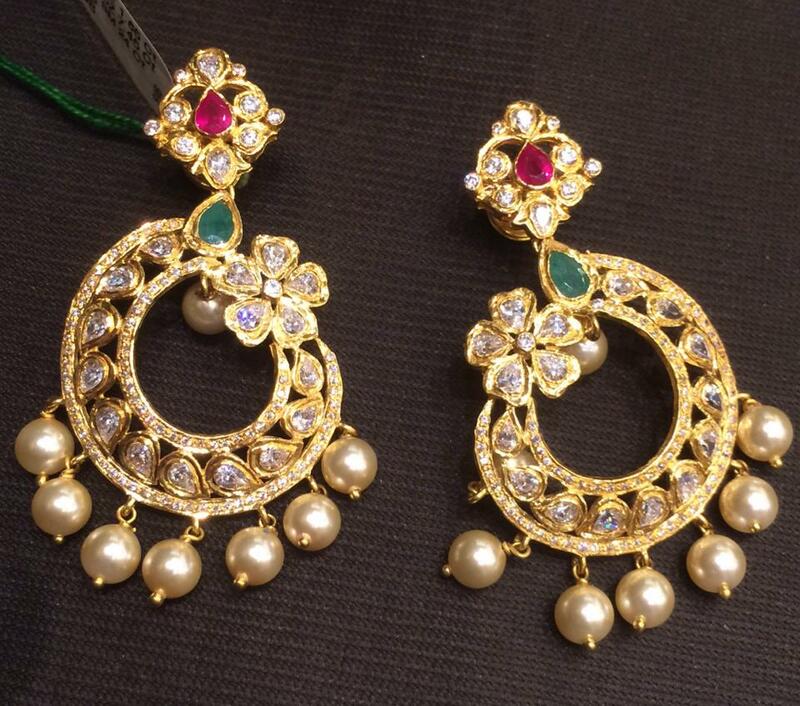 Eye catching lakshmi harams and attigais studded with rubies and emeralds are a good catch. 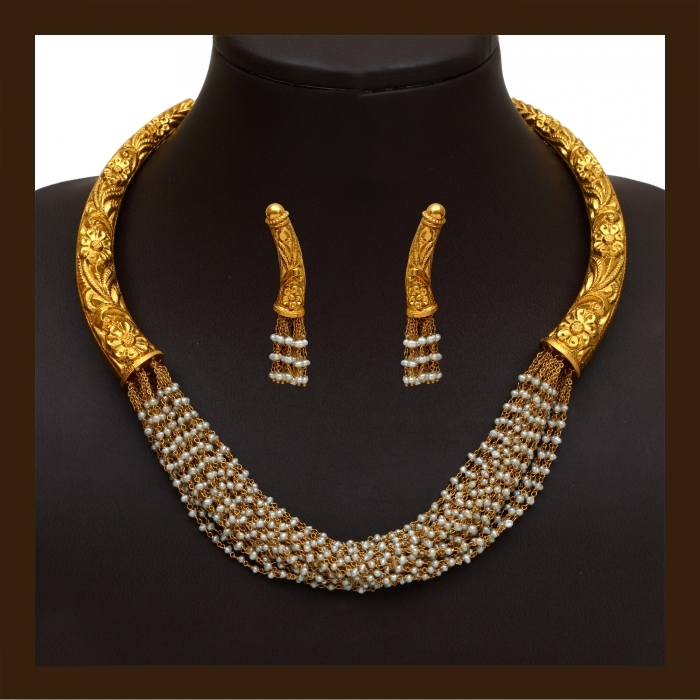 You can either opt for antique collections, or jewellery with oxidized finish while buying this. If you love to wear sarees for poojas and festivals, having a good necklace like below is sure a great addition to your jewel box. Yes, long gold coin necklace is still going strong in jewellery trend. You might have already seen your mom and grand ma having a sweet spot for these beauties. Good news, these age old traditional pieces still haven’t lost its charm. If you love to give a classic vibe to your outfits, then wear a long coin necklace (aka kasumalai ) with antique jhumkas to look regal. Just like the classic coin necklace, mango malas has still retained the deep connection it enjoyed with women of past two decades. This vintage jewelry design has been given modern spin by jewellery designers to suit the desires of contemporary women. So we get to see really huge sophisticated mango malas being flaunted by everyone. It doesn’t matter whether you are in 20’s or 30’s or 40’s, a good mango necklace design will always brighten up your look. How many of you have a huge crush on pearls? We don’t know about you, but we sure do have a big crush over these beauties. 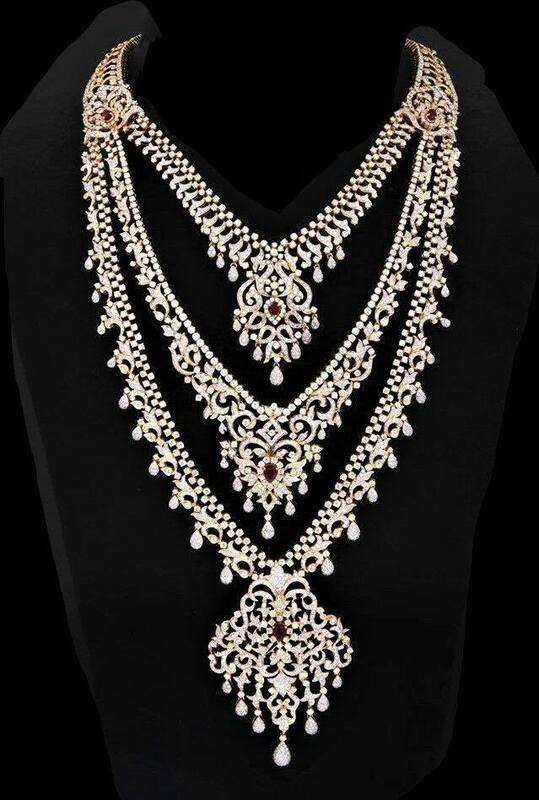 Fine necklace embellished with big south sea pearls are such a appealing design to wear with your sarees and lehengas. Also, pearls flare well in fashionable pieces too. 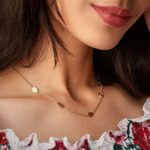 Yes, if you are bored of antique collections and would love to invest on fashionable jewellery designs, then consider tiny pearl studded chokers and necklaces. From your off-white sarees to deep red kanchivaram silks, pearl jewellery can sit comfortably on any outfit. In short, it is a blessing for jewellery lover. The fame of antique jewellery that has captivated the women of all age with its charisma is quite unfathomable. Check any jewellery store; you will see a separate section for antique collections. 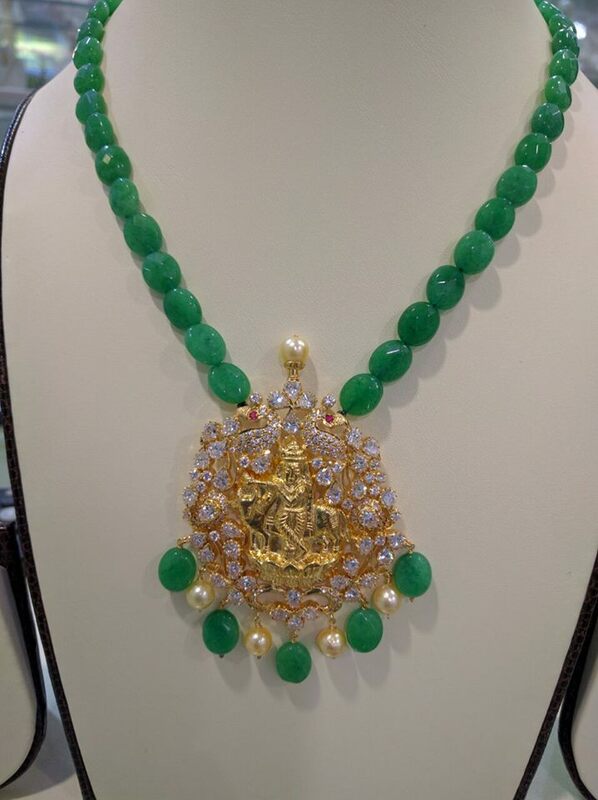 This speaks volume that how antique jewellery have become indispensible these days. 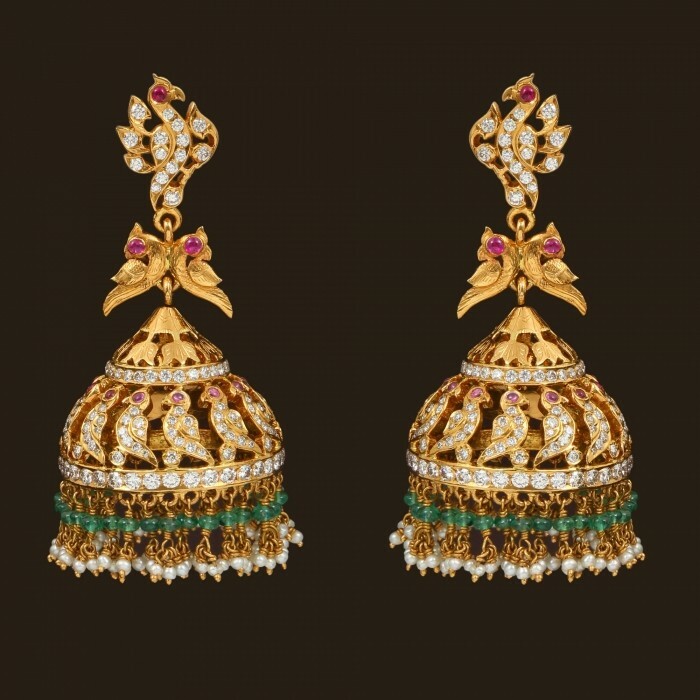 Bold antique chandbalis and jhumkas are favorite earrings to shop right now. If you are a lover of vadanams and tikkas, you don’t even have to look for alternate choices; do pick a bold antique one to flaunt with no inch of doubt clouding your mind. Next to rubies, emeralds are making waves. 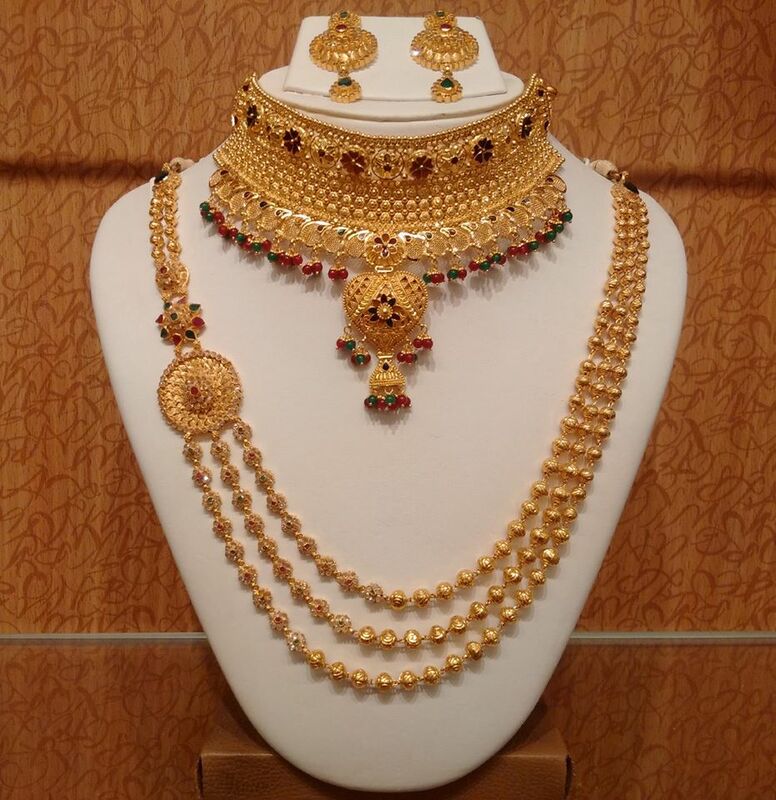 Those who love to shop exclusively colorful pieces for their precious collection should and must buy a good emerald necklace, earrings and bangles. 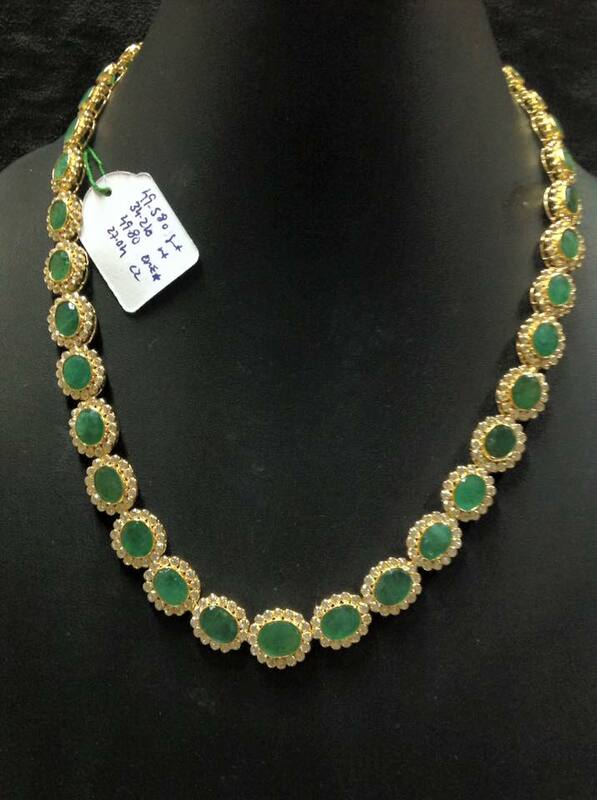 You can either shop antique pieces or more trendy emerald designs studded along with sparkling CZ stones. Don’t you feel your green dresses badly needs this? Well.. We have certainly not missed out the dashing bold beads and gems on gold jewellery. Enticing bold beads on your necklace and bangles are sure to increase the beauty of jewellery many times. The daring loud guttapsualu with its heavy pearl clusters and fine stone work is always a delicious treat to wear with sarees , lehengas and anarkalis. If you like to own statement jewellery piece that should stand test of time, do give a good guttapusalu necklace a try. You won’t be disappointed. It is kind of heritage piece that you can pass generation after generation for your clan to retain. Plain gold jewelleries have taken a back seat these days. In its place you can see bold CZ stone studded glittery pieces stealing all the show. Visit any jewellery store and ask for CZ collections, you will understand the real demand of these beautiful pieces. The good thing about the current jewellery trend is that, we get to see many traditional designs still retaining its center stage. 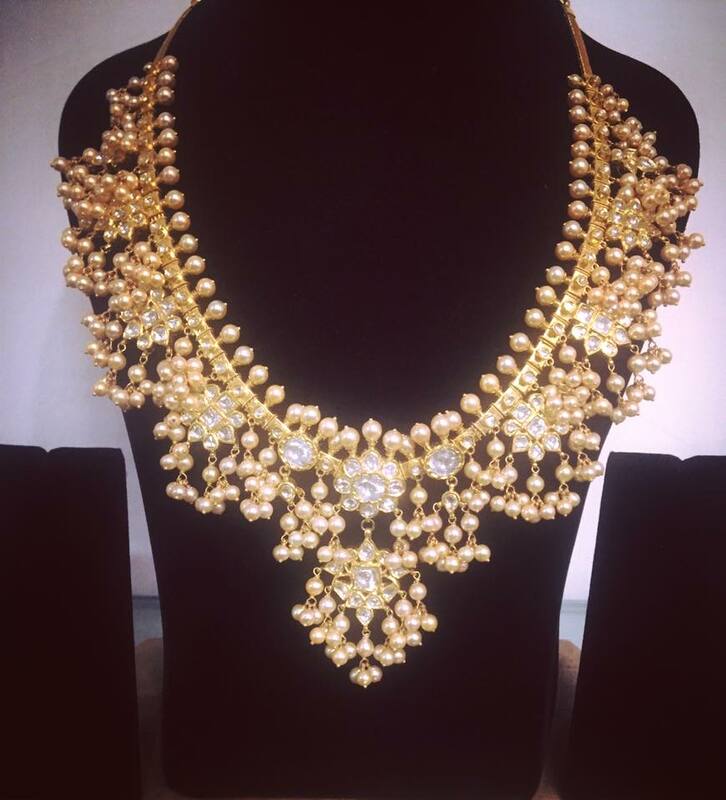 Especially when it comes to bridal jewellery, women just love to pick antique pieces and temple necklaces more than something fashtiobale. That’s a really a great thing. On those traditional designs, please do include nakshi work for the immense popularity it has gained during the past few years. Can we ever stop lusting diamond jewelleries? If only..If only it is affordable! Sigh! Yet, if budget is not a big thing, we request you to prefer diamond jewellery than any other collections we have listed down so far. It is by far the most exotic jewellery you can wear any day. 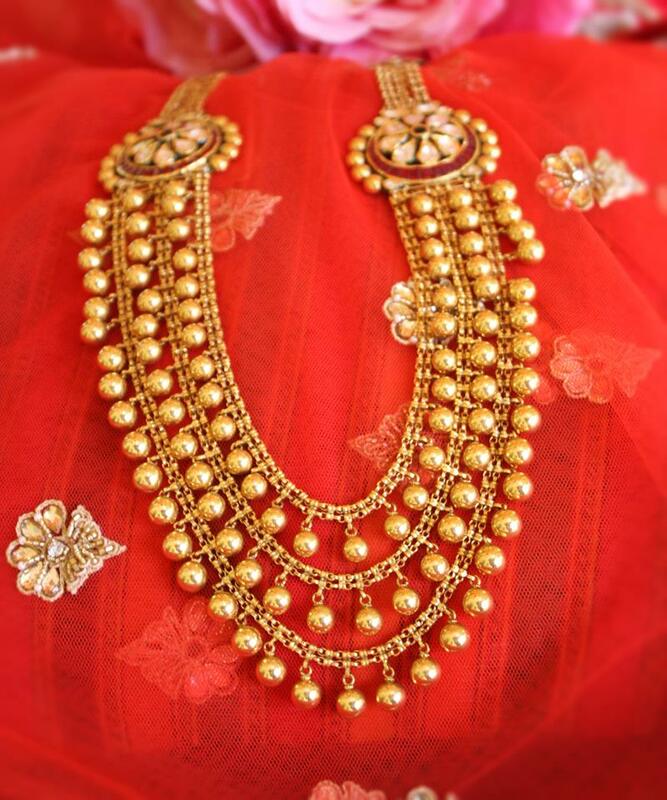 Even a simple diamond necklace will sure make heads turn on to you in wedding halls. Such captivating these beauties are! Ok..so far we listed down all the latest collection in the world of gold jewellery. Of course no matter how much we badly want to own them, cost do plays a significant role. So if you ask us, what are the basic pieces that one should shop for events like weddings, then we have a much confined list below. This is absolute must for bridal events. Pick a bold one with rubies and emeralds. Else you can opt for jhumkas with pearl clusters. 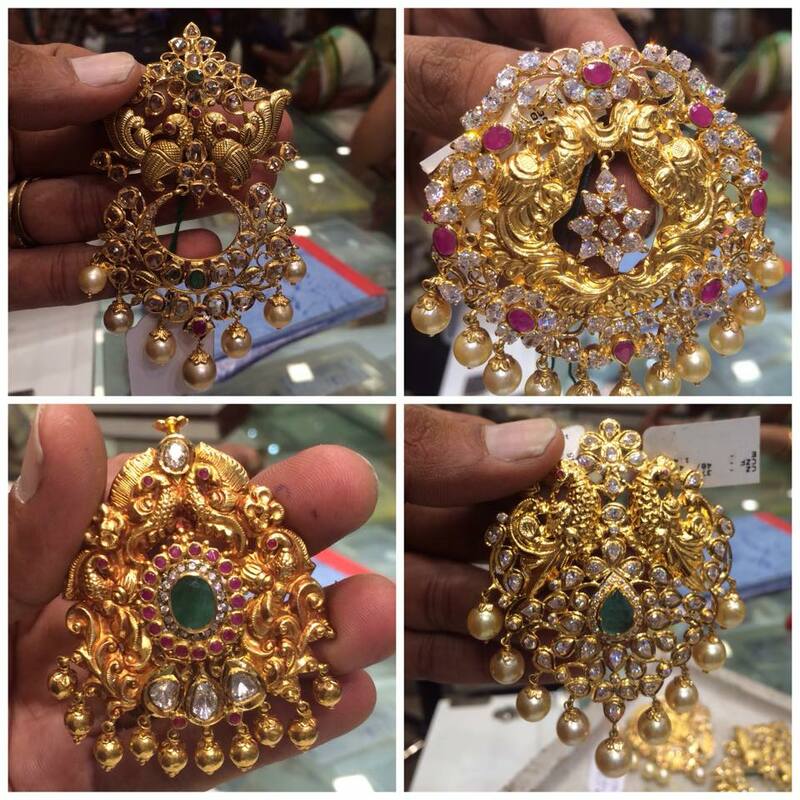 Even lakshmi jhumkas are quite popular this season. This season is all about statement bangles. If you plan to shop bangles for your wedding, then ditch the sleek bangles and opt for bold ones with big stones. Antique bangles are so opt to wear this year if you like to stay in trend. A pair of chandbali can lighten up both your silk saree and anarkali. Some jewellery designs gel well with sarees alone. 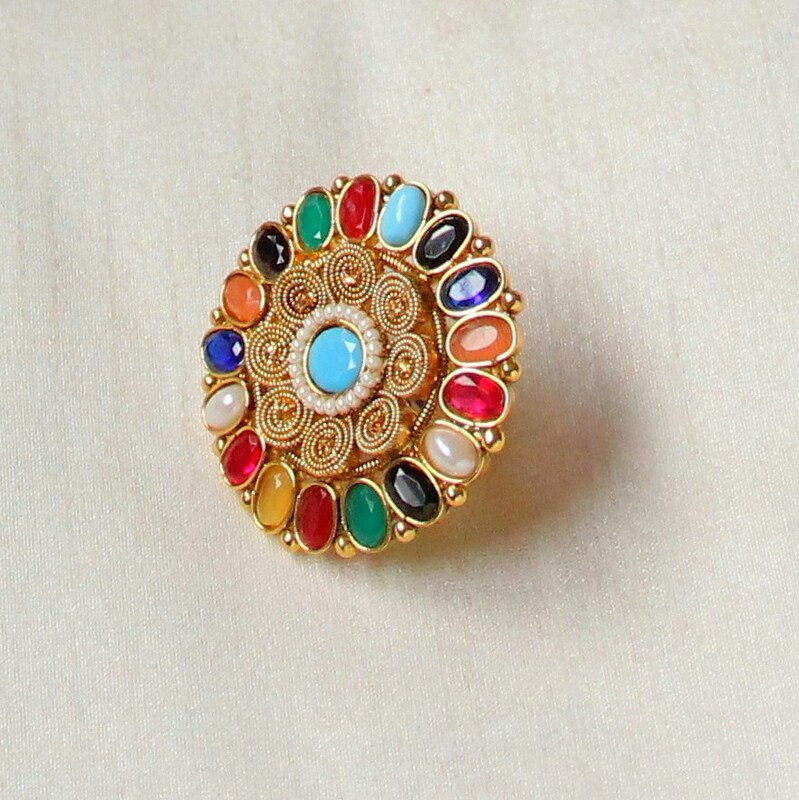 Your trendy ethnic dresses need more fashionable jewellery. However with chandbalis, erase the doubt. Because they can look both traditional and voguish at time on any outfit. Yes, do give rings the special place it deserves. Not a miniature sleek ring, but a loud cocktail one that can instantly bring the attention to your tender fingers. 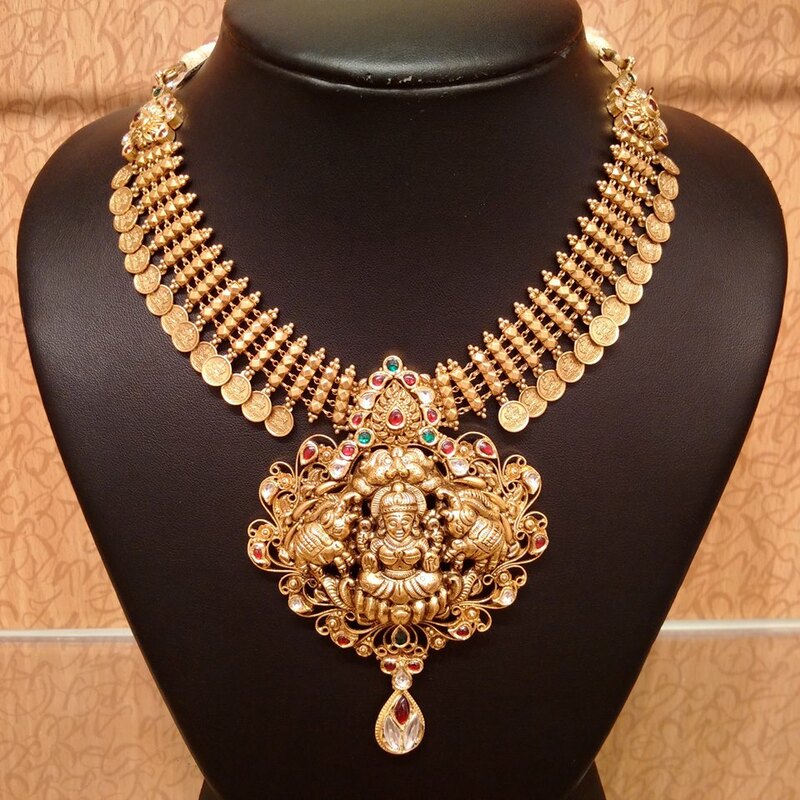 This is must have jewellery piece especially if you are the bride. Go pick an antique one with lots of stone work, preferably rubies and emeralds. Alternatively, you can try temple vadanams too. We always underestimate the power of pendants. Yes with a mesh chain and few antique pendants, you can rotate and reuse them with any of your outfits. 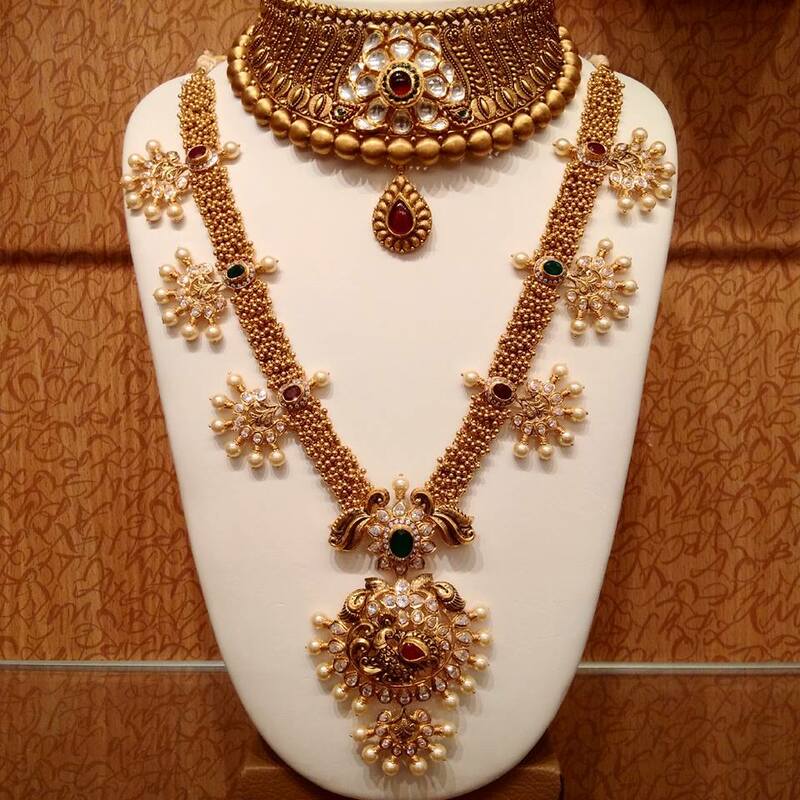 Besides, it is lot more cost effective than necklace and attigais. 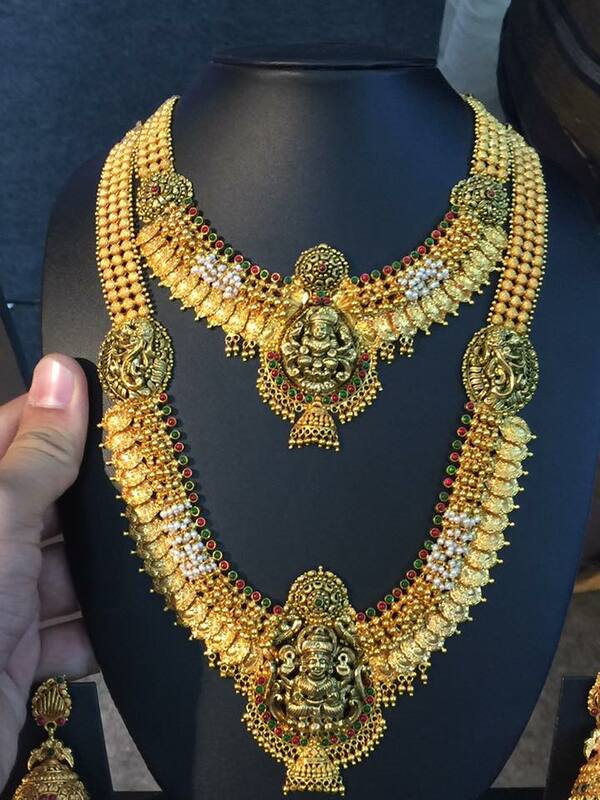 We hope you had a glimpse on the latest gold jewellery designs you can possibly wear on wedding related events. If you are the actual bride, then you need to invest on bold pieces that speak for our rich tradition and culture. However, for others you can opt for subtle jewellery designs from the above choices that suits your taste. Now tell us, what is the one jewellery piece that you can’t live without! 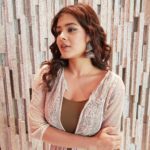 Popular And Trending Necklace Designs Of This Year! 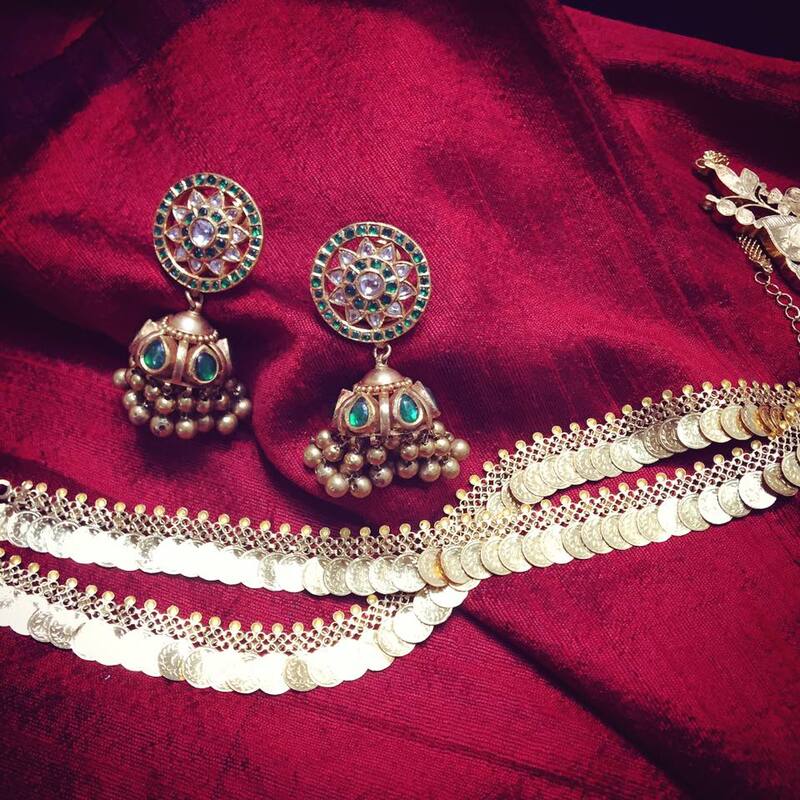 What Jewellery to Wear With Red Saree?